Nicki Minaj says she's cancelling her appearance at the BET Experience Concert after the network tweeted about her and fellow rapper Cardi B.
Minaj said Monday on social media that she won't perform at the concert or BET Awards. The seventh annual concert series will be held June 20-22 at the Staples Center in Los Angeles ahead of the BET Awards on June 23. The cancellation comes after BET tweeted Sunday that Minaj was "being dragged by her lacefront" following Cardi B's historic Grammy win for best rap album. Cardi B, who won for Invasion of Privacy, is the first solo female rapper ever to win in the category. 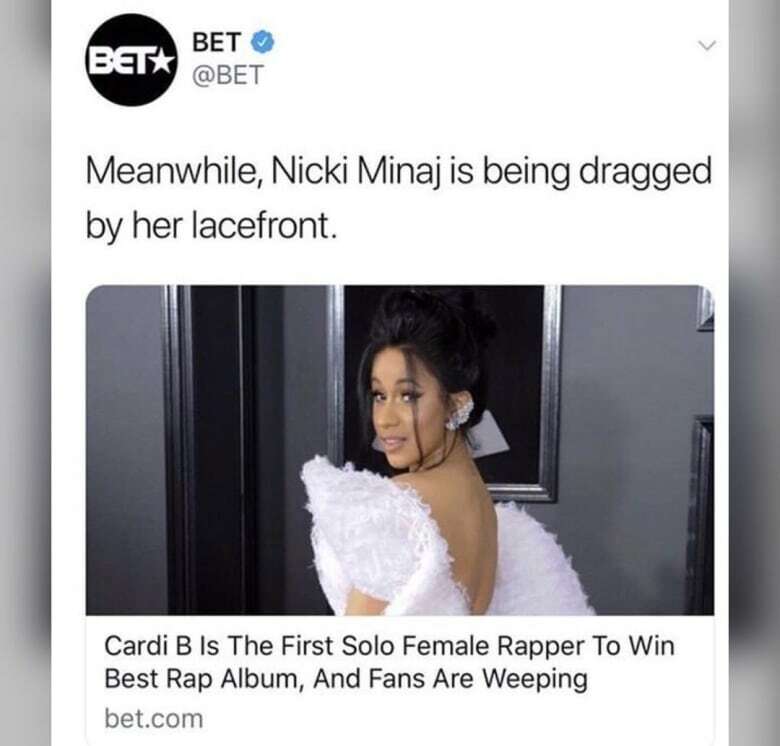 The tweet has been deleted and, in a statement, BET apologized to Minaj for the "hurt, disappointment and confusion that this post has caused." The network says it will conduct an internal investigation. Also on Monday, Cardi B — who has been characterized as a rival to Minaj — deleted her Instagram account after posting an expletive-laden video in which she described receiving a torrent of online abuse ahead of and after her win on Sunday. She also noted she wasn't a fan of those who "put other people down to uplift somebody else. That's not my style and that's not what I'm with and I don't support that."